SPRINGFIELD, Ill.--(BUSINESS WIRE)-- Springfield Clinic’s Ambulatory Surgery and Endoscopy Center (ASC) was the first ASC in Illinois to enhance patient safety with the use of a Xenex™ LightStrike™ Germ-Zapping Robot™ to disinfect operating rooms. The ASC recently expanded its surgical services to include outpatient joint replacement procedures and has had 0 infections resulting from those complex total shoulder and total knee procedures. Springfield Clinic staff credit the LightStrike disinfection robot with a significant role in their robust infection prevention program and consider environmental disinfection as part of their outpatient surgical standard of care for patients. Operating rooms (OR) are supposed to be sterile environments, but studies show these rooms remain contaminated with microscopic pathogens that can cause surgical site infections even after the OR has been cleaned using traditional methods. Some of the superbugs that threaten patients and can cause infections, such as Staphylococcus aureus, Enterococcus, Klebsiella and Pseudomonas, are capable of living on OR surfaces from 1.5 hours to more than 30 months. LightStrike Germ-Zapping Robots have been proven to quickly destroy germs and bacteria in ORs using intense pulsed xenon ultraviolet (UV) light. 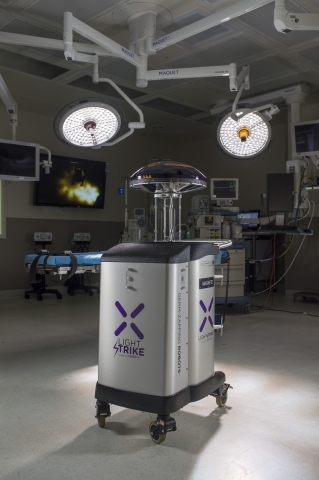 Hundreds of hospitals and surgery centers, including Springfield Clinic’s ASC, use LightStrike robots to disinfect their ORs after procedures are complete. Two hospitals have published peer-reviewed studies showing 46%-100% reductions in their SSI rates when the LightStrike robot was used to disinfect ORs after terminal cleaning. Springfield Clinic’s ASC is taking an additional preventive measure and disinfecting ORs prior to performing total joint procedures. Springfield Clinic’s state-of-the-art ASC has already achieved one of the lowest infection rates recorded at less than one percent and earned the highest marks possible for quality and safety from the Accreditation Association for Ambulatory Health Care (AAAHC). As a result of their commitment to patient safety and robust infection prevention program, Xenex has designated Springfield Clinic as a Visionary Outpatient Surgery Center. Visionary Outpatient Surgery Centers are defined as facilities that 1. Make patient safety a top priority; 2. Seek out and implement technologies with multiple proven outcomes published in peer reviewed publications; 3. Follow manufacturer recommended best practices; 4. Publicize and share results to improve best practices for all hospitals; 5. Openly share their data for their benefit and the benefit of all mankind. Springfield Clinic is a progressive, physician-led multispecialty medical group, devoted to providing the highest quality health care to its patients. More than 400 physicians and advanced practitioners deliver value-based care in approximately 80 medical specialties and sub-specialties. As one of the largest private, multispecialty medical clinics in Illinois, Springfield Clinic currently employs over 2,000 clinical and administrative staff members who are committed to leadership in quality, service and technology. For more information, please visit www.SpringfieldClinic.com. Xenex's patented Full Spectrum pulsed xenon UV room disinfection system is used for the advanced disinfection of healthcare facilities. Due to its speed and ease of use, the Xenex system has proven to integrate smoothly into hospital cleaning operations. Xenex’s mission is to save lives and reduce suffering by destroying the deadly microorganisms that cause hospital acquired infections (HAIs). The company is backed by well-known investors that include EW Healthcare Partners, Piper Jaffray Merchant Services, Malin Corporation, Battery Ventures, Targeted Technology Fund II and RK Ventures. For more information, visit Xenex.com.